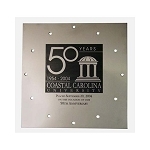 Once you place a time capsule box in your shopping cart, click on the main link below to see the sizes to choose. From the size of the lid (or the first two numbers on the time capsule size), choose the matching laser engraving and add to your cart. You can put your message on the space provided, or email us what you want. You'll get a proof to approve withing a day or two. Allow 2 to 3 weeks' time for this engraving process. Allow 2 to 3 weeks for engraving your time capsule lid.